Wirt Design Group has developed the new offices for a confidential financial services client located in Beverly Hills, California. Having significantly grown during the last recession through successful acquisitions this leading iconic financial institution has a renewed commitment to connect with their clients on a personal level, to be sensitive to clients’ values, and to support the local communities they serve. 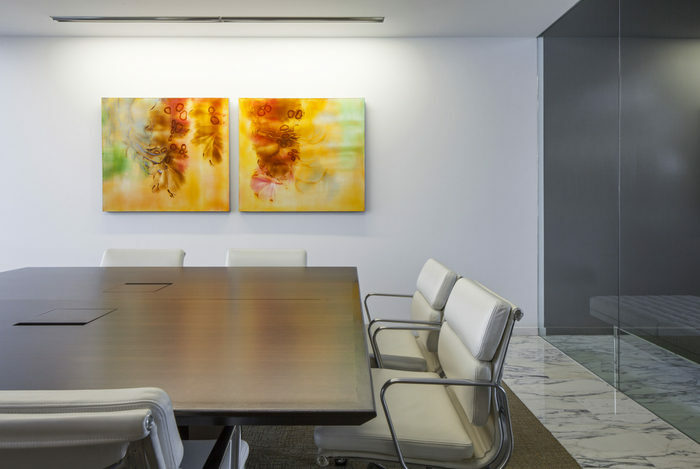 With these directives in mind, Wirt Design Group was retained to redesign several of their private wealth management locations throughout Los Angeles. For the first assignment, a private wealth management bank in Beverly Hills, this meant creating a space that resonates with their unique clientele, reflects the character of the community and supports the functions of this highly specialized segment of their business. The design team delivered space for the client’s experience that reflects luxury without being ostentatious. Upon entering reception, one is immediately welcomed by views of the hills outside. Floor-to-ceiling glazing and the openness of the space allow unobstructed views. Dark wood paneling frames the view and linear recessed lighting draw the eye outside. Furnishings and finishes are quality, timeless and tailored and the space is grounded on solid natural marble flooring. The reception, client waiting area and various meeting spaces support both formal and informal meetings and transactions. A casual meeting room offers a relaxed environment but is still elegantly finished in leather and wood. Abstract nature inspired art by Los Angeles artists recalls the community and adds whimsy and color to the otherwise clean, neutral space.